deaffriendly | Deaf Awareness Week | Have you Met This Year's #deaffriendly Models? Yesterday, we pulled our stretchy, XL-sized Tri-Blend #deaffriendly tees on our newest fashion models. For the past 35 years, these models have donned a French flag, cancer awareness signs, colorful umbrellas for Seattle rain, Batman costumes, and even a cardboard edict on kindness. They – a woman, a child, and three men waiting at a symbolic bus stop – are made of cast aluminum. But Seattleites bring them to life every week, with quirky decorations and signs. Fun facts: Three years ago, 31,000 drivers crossed the Fremont Bridge every workday. It's not just cars, either: This spring, a whopping 6,088 bike riders shattered the record for weekday riders over the Fremont Bridge. Many of these commuters work at the nearby Google, Tableau, and the former Adobe office in Fremont, meaning that the Interurban Sculpture gets right into the consciousness of the city’s best and brightest minds. So we thought: Where better to illuminate this message for Deaf Awareness Week, than one of Seattle’s most famous sculptures? 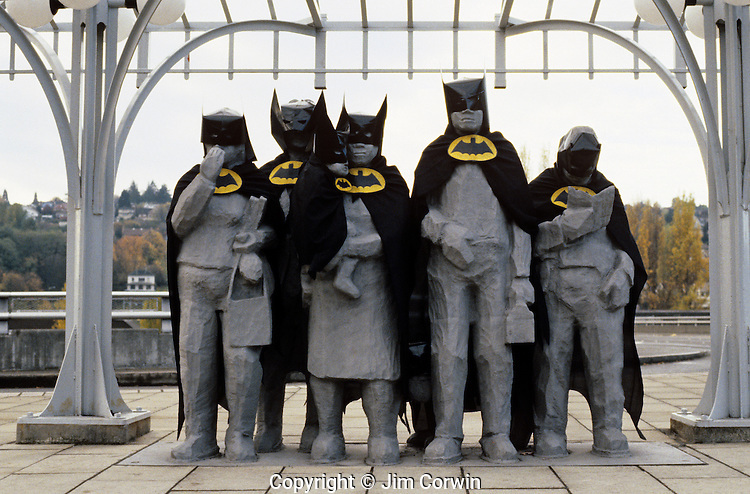 In 1979, artist Richard Beyer created this sculpture, called “Waiting for the interurban.” It referred to the early 20th century interurban line that connected other major metropolitan centers (like Everett) with Seattle. But it’s not just about transportation; it’s about community -- schools, a library, churches, a hotel and many small businesses. The Deaf Community also needs that kind of connection not just within itself, but also within the hearing world. For centuries, the Deaf Community has also been waiting. Not just for a bus, or a bus with captioned stops, or a bus with signing drivers. We’ve been waiting and waiting for a more deaf-friendly world. As Abe Lincoln said, the best way to predict the future is to create it. That’s why we’re not waiting for business owners to read our minds – we’re taking a proactive leap into a more accessible future. So, do you know what it means to be #deaffriendly? Here’s a few tips. If you get a chance to pass through Fremont this week, be sure to snap a picture with these aluminum-cast celebs. Tired in Fremont? Get your caffeine pick-me-up at the friendly Starbucks (5- stars)..Hungry in Fremont? Check out Chiso Restaurant (5- stars) forSpicy Bara Chirashi, or Brad’s Swingside Café for a plate of aglio olio, followed by a bite of Kahlua Swirl Cheesecake at Simply Desserts (4- stars). Once DAW is over, we’ll drop off pictures to History House a few blocks over. Will you become part of a history in the making, and a more #deaffriendly future? Share and send us your pictures and comments about what it means to be deaf-friendly!